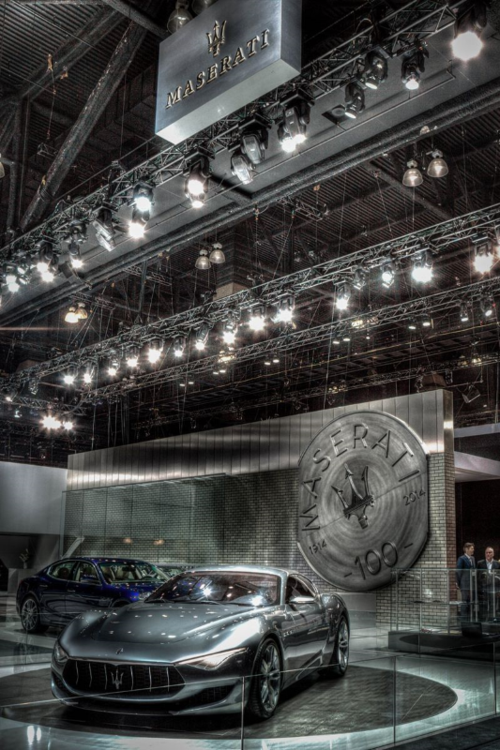 (November 19, 2014) Englewood, Cliffs, NJ– At the Los Angeles Auto Show, Maserati took center stage presenting its complete MY 2015 range including the sportingly redefined Quattroporte GTS and sensational Alfieri 2+2 concept, which made its Los Angeles, California premiere and impressed audiences around the world. The highly praised Ghibli performance sedan and Centennial Edition GranTurismo MC coupe and convertible, also on show, continues for MY2015 after launching to tremendous success. In partnership with the Petersen Automotive Museum, Maserati revealed a vintage 1963 Quattroporte (Tipo 107), the world’s first super sedan and one of the oldest Quattroportes in existence. Designed by Pietro Frua to drive every day in luxury, the original Quattroporte was well poised alongside the new generation Quattroporte offering a glimpse of Maserati’s century-long history of engineering expertise and timeless style in honor of its 100th birthday. 2014 continues to be a very significant year for Maserati as it celebrates—in addition to its 100th Anniversary—the most comprehensive, best-selling product range in the history of the company. It has been a record breaking year, particularly for Maserati North America, Inc., Maserati’s global market leader. The company posted a 253 percent year-over-year increase this October; its twenty-first consecutive month of sales increases in the Americas with 2014 results have far exceeded those for 2012 and 2013 combined. Maserati North America, Inc. continues to expand, with 100+ dealers across North America, nearly doubling its stores since 2013. California remains a market leader among Florida and the Tri-State area. With a total of seventeen dealerships across California, which are mostly mono-brand Maserati stores, the growth has been exponential. Maserati is the perfect fit for California where the car culture is so strong and customization is highly sought after. Now on sale, the 2015 Quattroporte range includes enhancements and added standard equipment for both S Q4 and GTS. The top range Quattroporte GTS, with 523 HP from its potent twin-turbo V8 powering the rear wheels – benefits from a sportier and aggressive appearance, heightening its dominance on the road while further differentiating its position at the very top of the range. Aesthetically, the vehicle’s exterior has been upgraded by revising its color scheme: the front spoiler, lower side sills and lower rear bumper are now matched to the car’s body. The front grille surround is finished in gloss black. The front trident and side saetta badges have been introduced with red accents to underscore this high performance model along with a GTS badge on the rear decklid. Further enhancements include 20” light weight forged alloy wheels finished in anthracite grey with center caps featuring a red trident logo. The narrow wheel spokes allow a good view of the red anodized brake calipers, which are exclusive to the GTS. The GTS interior has been upgraded with Poltrona Frau premium leather with contrast stitching and Black Piano trim. More interior details include a GTS badge added to the dial of the dashboard clock and an embroidered GTS logo of the drivers’ side floor mat. The 2015 Quattroporte S Q4 – with 404 HP, state-of-the-art twin-turbo V6 engine and standard all-wheel drive- the selection of options has been expanded to include three new paint finishes. Grigio(medium grey), Grigio Maratea (Dark Grey) and Bianco Alpi, a pearlescent white finish. Two new wheels become available: 19” Apollo wheel with a diamond-smoothed, matt transparent anthracite finish and 20” GTS design wheel in silver finish. A wider selection of interior features is available including contrast stitching, red leather upholstery and Black Piano Lacquered trim. Wifi in vehicle hotspot also becomes standard on the Quattroporte range. Created to commemorate Maserati’s Centennial, the Alfieri—which takes its name from Alfieri Maserati, the most prominent of the Maserati brothers—explores the stylistic heritage of the brand and anticipates future design trends. A sleek, Italian style 2+2, today’s Alfieri is at the concept stage, yet poised for reality: it was created, designed and built with this goal in mind. This concept interprets Maserati’s most iconic signatures: restyled triple air ducts on the wheel arches; the Trident emblem in a central position on the front grille; the “Saetta” logo on the rear pillar; and forged wheels whose spoke design gives a nod to the Trident profile. The designers’ brief was simplicity and minimalism with a “kick of poetry” to create the comfortably sized 2+2 seat passenger compartment while emphasizing the racing nature of the brand. Poltrona Frau aniline leather has been generously used for the interior, matched with copper, aluminum and other materials reminiscent of oxidized steel, commonly used in the racing cars of the Fifties. Vintage racing also inspires the wraparound design of the seats, offset by their futuristic look and modern structure. One of the most fascinating cars of all times designed by Pininfarina in 1954, the A6GCS proved a valuable source of inspiration for the designers of the Alfieri concept of today. These models are launched as tributes to the first 100 years of Maserati history, in line with the sporting spirit that has traditionally identified the brand. Both models are available in three new tri-coated color combinations which include Rosso Magma and Blu Inchiostro, a modern interpretation of the Maserati shield colors and also represent the traditional colors of Bologna, Maserati’s birthplace founded in 1914. The wheel range includes as many as four different versions for two available designs, MC and Trofeo design. Specially designed center caps integrate the Centennial medallion logo, available in two finishes: Matt Smoke grey and Charcoal grey according to wheel style and color. The Centennial Special Editions come with a wide range of interior options with a contrasting decorative insert based on the three colors (red, white and blue) of the seat profiles. The same motif also extends to the headrests and surrounds the embroidered Trident logo. The sporty look of the interior is enhanced by carbon fiber inserts on the dashboard, seat surrounds and by a kick plate on which the celebratory Centennial logo takes pride of place. The GranTurismo MC Centennial Edition is powered by the 454 HP 4.7 liter naturally aspirated V8 engine that first appeared in the GranTurismo MC. Combined with a 6-speed automatic transmission, performance and balance is superb with a top speed of 185 mph, together with the assured stopping power of Brembo Dual-Cast brakes. In keeping with Maserati’s philosophy, the new GranTurismo MC also capitalizes on the progress made by the previous model in terms of reduced fuel consumption and emissions. These 2015 celebratory models, The Centennial Editions of the GranTurismo MC coupe and convertible complement the current Maserati range. Maserati is celebrating its 100th Anniversary all over the world in 2014 with special programs for clients and fans including the recently activated Cento Anni di Maserati, a series of epic driving events in Washington, DC (November 1,2); Miami, FL (November 7); and Los Angeles, CA (November 22) to honor the occasion. Over 100 Maseratis will gather this coming Saturday, November 22nd on Santa Monica’s famous pier for a commemorative parade to the Los Angeles auto show, providing clients special access to the Maserati stand. As an honored marque, this year Maserati has also been at the very center of the world’s most prestigious motoring gatherings including the Villa d’Este Concours d’Elegance in Como, Italy; England’s Goodwood Festival of Speed; and California’s Monterey Car Week including the Pebble Beach Concours d’Elegance. At the 70th Annual Columbus Day Parade in New York City, Maserati set the pace as the parade’s leader and featured marque. In Modena, Italy, the Enzo Ferrari Museum is hosting (through January 2015) “MASERATI 100 – A Century of Pure Italian Luxury Sports Cars.” Modena also staged September’s Official Maserati Centennial Gathering, where over two hundred vintage and modern Maseratis from all over the world (and approximately five hundred participants) set-off for a historical road rally retracing the brand’s storied roots.